Nine-Time World Champion Logroller, Dan McDonough continues to bring you the finest in competitive lumberjack shows with the best in family entertainment featuring world-class competitive lumberjacks. 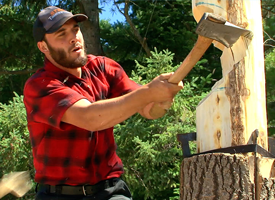 See World Champion Lumberjacks in head to head competition! Chopping, Sawing, Axe Throwing, Log Rolling and Speed Climbing – it’s a great combination of action packed fun and comedy! Shows daily in Mackinaw City, rain or shine. Jack Pine Lumberjack Shows: The #1 Attraction in Mackinaw City! Lumberjacks demonstrate turn of the century skills including chopping, sawing, axe throwing, cross-cut sawing and logrolling. In addition to the competition, there is also a chain saw carving demonstration. Our show educates the audience in the rich history of Michigan’s logging past. It is fast paced, up-beat and keeps the audience involved. The lumberjack show is appreciated by audience members of all ages from 2-102. 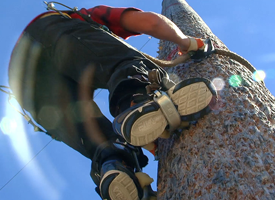 Lumberjacks compete to scale a cedar spar pole and return to the ground in record time! Lumberjacks spin a floating log with their feet and try to make their opponent fall! 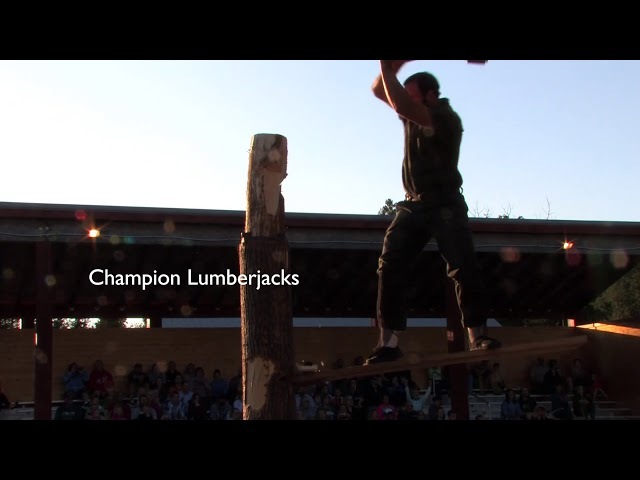 Lumberjacks climb onto a springboard and chop through a log mounted on top of the pole! Start the log-rolling dock, lumberjack competitors run head to head on adjacent booms!